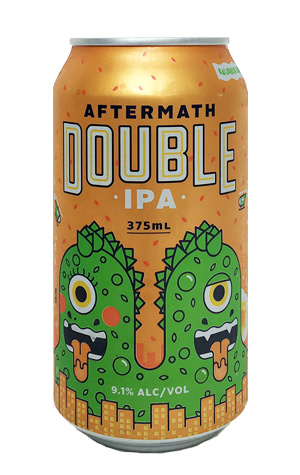 Aftermath is the beer that announced, in no uncertain terms, that there was a new hop fiend on the scene. However you look at it, opening your account with a 9.1 percent ABV "ludicrously hopped" double IPA is a bold statement. It was one that was noticed by Aussie beer lovers, particularly as – then under the Monster Mash banner – the KAIJU! crew managed to deliver their ludicrous hop barrage with a meaty enough backbone of malt and booze to keep it together. As is usually head brewer Nat's wont, it's an all-American assault on the hop front, presenting predominantly as citrus and ripe pineapple against that full, toffee like backbone. It's well balanced, no mean feat with a beer of its size and hopping regime, and, in winter 2017 became the third KAIJU! beer to enter cans. As well as allowing more space for Mikey Burton's awesome artwork to unfurl, it should keep the hoppiness intact longer and means you can experience your own personal aftermath in somewhat more manageable doses than the previous 500ml bottles.